Our unique cleaning process for recycling PPE uses the ground-breaking natural ozone disinfection system, OTEX, from JLA. Our unique cleaning process uses the ground-breaking natural ozone disinfection system, OTEX, from JLA. While traditional thermal cycles use high water temperatures and may need harsh bleaching agents to remove stains, this eco-friendly solution works at low or ambient temperatures. 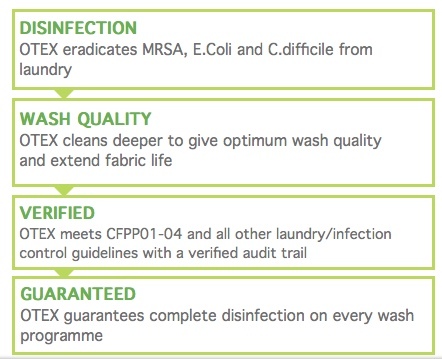 ​It means we not only achieve complete disinfection, but also extend the life of the fabrics we launder. OTEX disinfects more effectively than any conventional thermal alternative. It does this by turning oxygen from the air around us into ozone, and injecting it into our machines. This kills 99.999% of harmful micro-organisms such as MRSA, E.Coli, Norovirus and C.difficile spores. OTEX kills bacteria 3,200 times faster than chlorine bleach. Find our more about our environmentally friendly Disposal Process. Contact us today – by telephone, email or complete our ‘Contact Us‘ form.